Officers are appealing for information following a robbery on board a train between Worthing and Angmering, in which a man threatened to stab the victim. The victim, a 16-year-old boy, and a friend boarded a train at Worthing station at around 3.30pm on Monday (March 12). A man who was already on the service asked the victim where he was going, a spokesman from British Transport Police said. The victim told the man that he was travelling to Angmering. The man then tried to engage the victim into a conversation about his coat, before looking around and asking the victim for the coat, according to the spokesman. When the victim declined to hand it over, he threatened him by saying that he would stab him and his friend, the spokesman said. He then asked him for anything else that he may have and he handed over some tobacco. 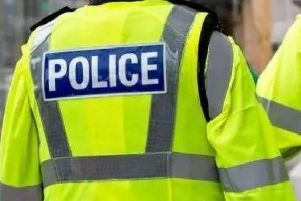 The man left the service at Angmering station and was seen to be picked up in a pale blue car with a distinctive dent in the passenger front side, the spokesman said. Officers are now releasing CCTV images of a man they wish to speak to following the incident, as they believe he may have information that could help with the investigation. Anyone with information should contact British Transport Police on 0800 40 50 40 or text 61016 quoting reference 264 of 29/03.